Maine Secretary of State Charlie Summers stops into the polls at the Bangor Civic Center Tuesday morning to visit election officials and voters before making his way to Scarborough. 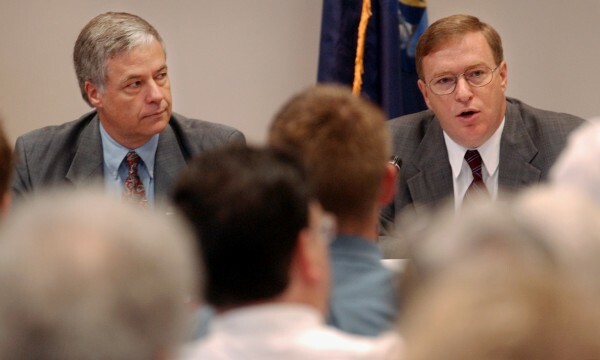 Candidates for the 2nd Congressional District Democrat Michael Michaud and Republican Kevin Raye face off in a debate in 2002. Raye and Michaud will compete for the same seat a second time this year. AUGUSTA, Maine — After Democrats threw their biggest names into the mix for Olympia Snowe’s soon-to-be vacated U.S. Senate seat earlier this week, Republicans were the newsmakers on Friday. Five members of the GOP took out petitions for a Senate run, joining previously declared Republican candidate Scott D’Amboise in the race. Secretary of State Charlie Summers became the first Republican to take out petitions after Snowe announced Tuesday that she would not seek a fourth term. 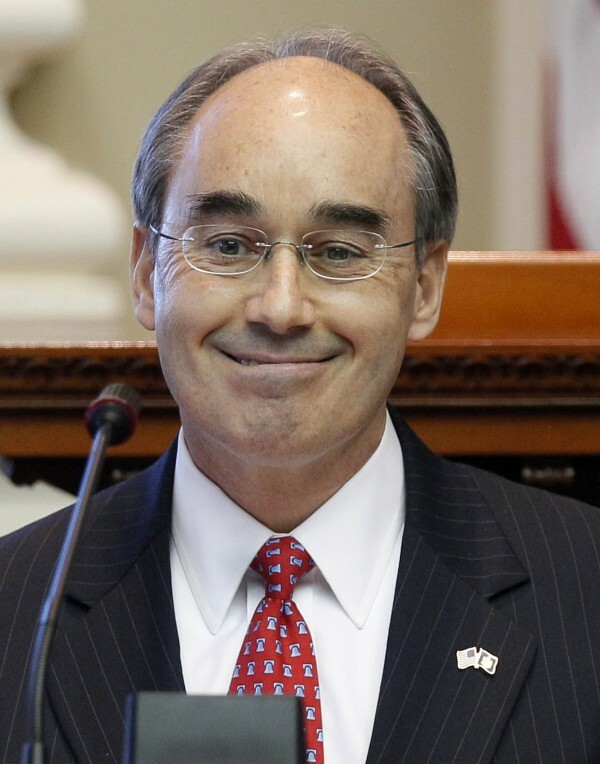 Treasurer Bruce Poliquin followed close behind Friday afternoon, then former Maine Senate President Rick Bennett and state Sen. Debra Plowman. Attorney General William Schneider joined the race late Friday. Summers, of Scarborough, was a longtime member of Snowe’s staff and an unsuccessful candidate for the U.S. House in 2008. Bennett, of Oxford, lost a U.S. House race to John Baldacci in 1994 and has been out of politics for about a decade. However, he has been a player behind the scenes and is the Republican National Committeeman from Maine. Plowman, of Hampden, had been exploring a run for the U.S. House but now says she’s considering a run for the U.S. Senate. Schneider served in the Legislature and the U.S. Army. “America is at an economic cross-roads — we are spending too much and our job climate continues to suffer,” he said in a statement. “The independent and self-reliant spirit of Maine can and should serve as an example to the rest of the country. Having served in the United States Army and as Attorney General, I understand the importance of discipline, hard work, and making the tough decisions to get our economy back on track. Poliquin, who lives in Georgetown, did not return a call for comment. In the three-plus days that have passed since Snowe declared she wouldn’t seek a fourth term, the Senate race — and the two U.S. House races — have started to come into focus. But things are far from settled and likely will not be until the filing deadline for party candidates on March 15. The race that was most clarified late Thursday night and early Friday morning was the 2nd District U.S. House race. Essentially, things are back where they started. Democratic Rep. Mike Michaud and his Republican challenger Kevin Raye, the Maine Senate president, both said they would forgo the Senate campaign and remain opponents for the U.S. House. Raye said: “It has been an extraordinary two and a half days since Olympia Snowe announced her unexpected retirement from the U.S. Senate. During that time, my wife Karen and I have been overwhelmed by the many kind expressions of support and encouragement we have received from friends and supporters across Maine. Michaud’s decision leaves U.S. Rep. Chellie Pingree, who represents Maine’s 1st District, and Baldacci, a four-term U.S. House member and two-term governor, as front-runners to be the Democratic nominee in the Senate race. 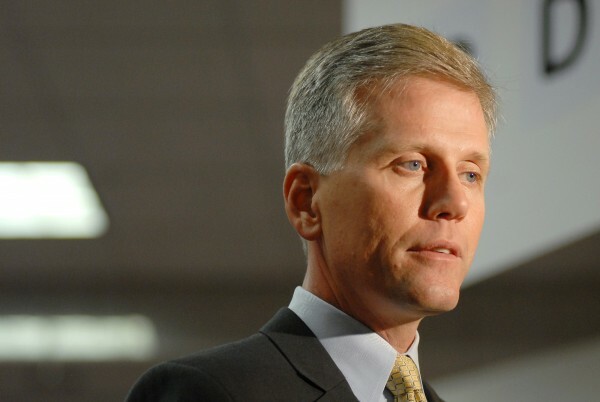 Former Secretary of State and U.S. Senate candidate Matt Dunlap, a Democrat, had taken out papers to run for the House but said Friday that Michaud’s decision effectively takes him out of that race. He plans to stay in the Senate race at least until March 15. Other Democratic Senate candidates include state Sen. Cynthia Dill of Cape Elizabeth and Benjamin Pollard, a Portland home builder, who were in the mix before Snowe made her decision. Raye’s decision paved the way for Summers, Poliquin, Bennett, Plowman, Schneider and maybe others. Republican-turned-independent Andrew Ian Dodge also is in, along with three little-known independents — Aaron Marston, Verne Paradie Jr. and Julia Carlson — who took out petition papers this week. Two big-name Republicans — former gubernatorial candidates Peter Cianchette and Steve Abbott — took their names out of consideration late this week. The decisions by Michaud and Raye also prompted some prospective 2nd District candidates to bow out. Emily Cain, the Maine House minority leader, announced late Thursday that she would not run for the U.S. House. Bruce Bryant, a former Democratic state senator from Dixfield, also dropped out of consideration for the 2nd District seat. The expected exit of Pingree from the 1st District House race could open the door for several Democrats. Already, six have secured petitions: Barry Hobbins, the state Senate minority leader; Sen. Phil Bartlett of Gorham; Rep. Jon Hinck of Portland; David Lemoine, former state treasurer; Wellington Lyons; and David Costa. Hinck had been a Senate candidate, but switched Friday to the House. Another name that has been mentioned is Hannah Pingree, former Maine House speaker and Chellie’s daughter. On the Republican side, only Patrick Calder had declared before this week. However, since Snowe’s decision and since Pingree has expressed strong interest in the Senate seat, three Republicans have begun the signature-gathering process: Jonathan Courtney, the Senate majority leader; Markham Gartley; and John Vedral. Party candidates for the U.S. Senate must turn in 2,000 signatures to the Secretary of State’s Office by March 15. House candidates must submit 1,000. Two prominent independents, former Gov. Angus King and former gubernatorial candidate Eliot Cutler, are contemplating entering the Senate race. Both have said they plan to make a decision by next week. Secretary of State Summers addressed a question that popped up shortly after he announced his intent to gather signatures for the Senate race: Can the state’s top elections official run for office and keep his day job? The answer is yes. Summers said there is nothing in Maine statute that requires him to step down, but he said there needs to be a clear separation between his job as a constitutional officer and his role as a candidate.